Here’s an impressive (if that word is not inappropriate, considering the subject matter) version of the World Trade Centre attack in New York, sent to us by the collector Vittorio Bedini, in Milano. 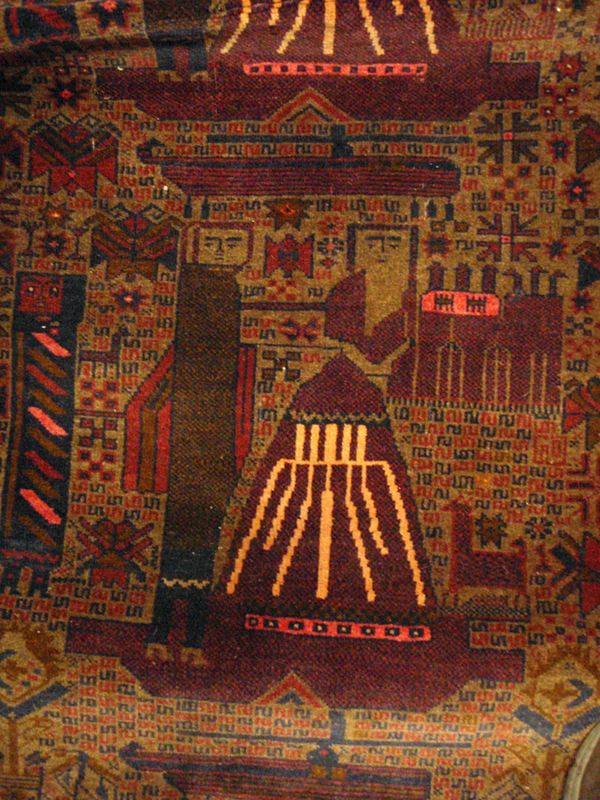 Its scale (240 x 150), plus its mosque design borders and its elaborate kilim skirts are all familiar indicators of the very best of Baluch-style carpets we find coming out of the Afghanistan/Iran border region. 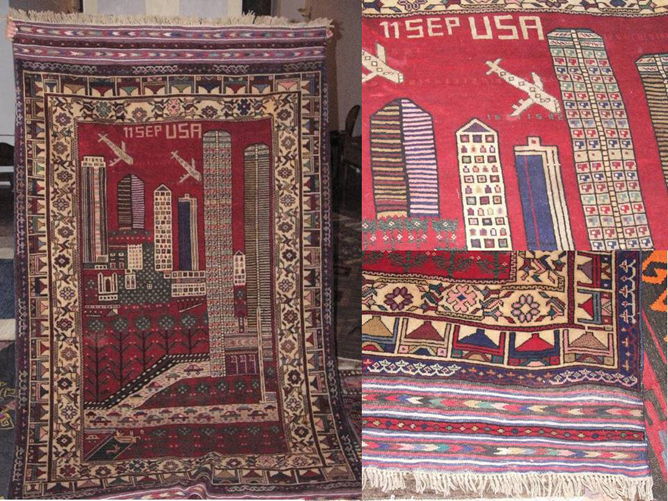 Its design is closer to the familiar but non-specific “modern city” carpets you can see on Max Allen’s TMC website for his Battleground exhibition. How easy is it for the designer to take a conventionalised scene, and drop the two aeroplanes into it… It leaves one wondering whether the designer’s intentions lay? We’d be very pleased to see any other variations on the S11 theme, if they are out there… Your reactions? See Ariel’s catalogue plus a walk-through of the exhibition now online. But what is the 2002 date doing there? As Kevin notes, when you translate the text in Farsi you will find that what normally reads: “The Soviet forces are exiting Afghanistan” reads “The al-Qaeda forces are exiting Afghanistan”. 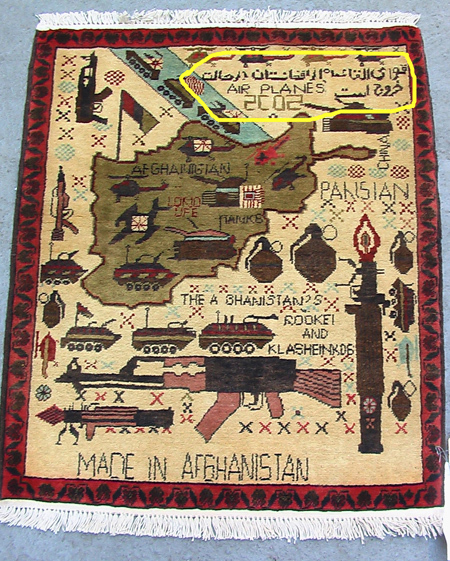 This shows how quickly antecedent designs and motifs of tourist art can be recycled to catch a potential market, that is, the new population of ISAF and NATO forces which began to arrive in Afghanistan from 2002 onwards. Kevin has many variants of this style on his site, which are worth careful examination to see these kinds of variations. For example, some include the dates of both the Saur revolution and the Iran-Iraq war, plus texts which (optimistically) read “international terrorists got wiped off [overthrown] from entire Afghanistan”. 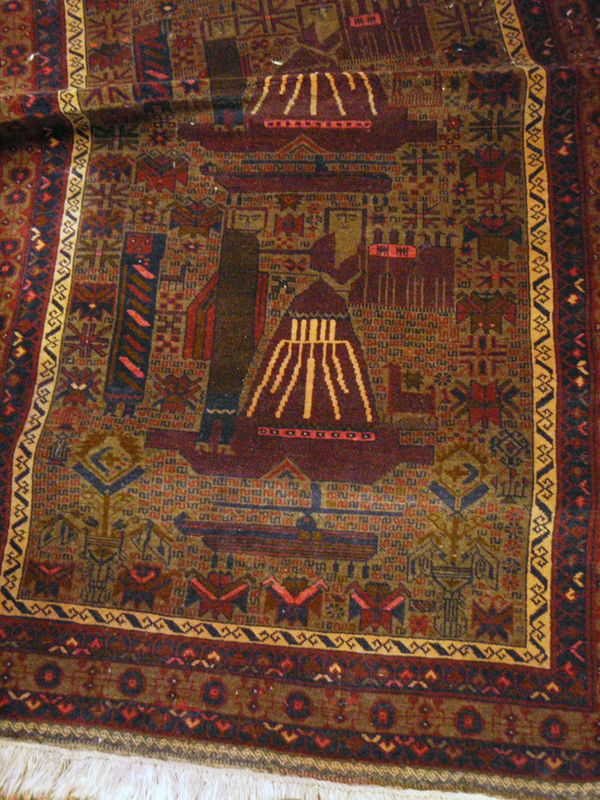 Accompanying this exhibition, the Museum will also display the Afghan Freedom Quilt: Silenced Voices of the Afghan Diaspora, a collaborative project sponsored by the Foundation for Self-Reliance. The quilt is a collection of blocks made by war widows in Afghanistan and assembled in the San Francisco Bay Area. Pieces sewn for this quilt are symbolic interpretations of what human rights, empowerment, equality, peace, hardship, sisterhood and freedom meant to each individual contributor. The Foundation for Self-Reliance conducts life-skills training and economic empowerment programs for Afghan women immigrants.